The Battle of Whitney Ave makes its first stop at the People’s United Center Friday night as the Quinnipiac Bobcats (20-5-1, 9-4-1 ECAC Hockey) host the Yale Bulldogs (8-10-3, 5-6-3 ECAC Hockey) in the 17th annual Hero’s Hat game. The Bobcats, who are ranked No. 4 in the country, look to extend their all time record against the Bulldogs to 21-7-5. Quinnipiac defeated Saint Lawrence last game 7-2, while Yale defeated Brown 4-3. 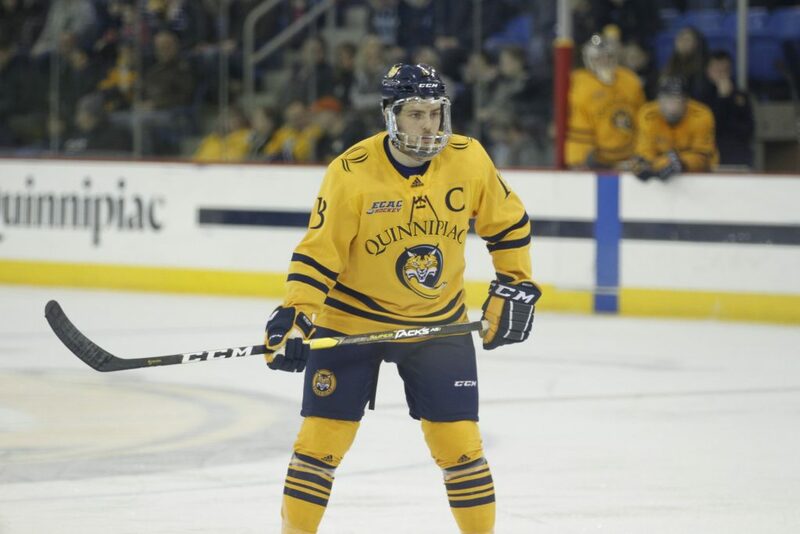 Quinnipiac needs big games from senior defenseman Chase Priskie and sophomore forward Odeen Tufto. These two players are the catalysts of the Bobcats offense. Priskie is tied for most goals in the country by a defensemen with 14, second in points by a defensemen with 33, and leads the nation in power play goals with nine. Tufto leads ECAC Hockey in points with 35 and tallying 274 faceoff wins. These wins in the circle spark the offense. Yale needs to contain them if they want a shot at that Hero’s Hat. Yale needs to rely on senior Joe Snively for offensive production. His 13 goals are third in ECAC Hockey – behind Tufto – and he leads the Bulldogs in assists with 14. His distribution of the puck and his ability to score goals are essential if the Bulldogs want to upset their rival down the road in their own barn. Quinnipiac has the weapons on the offensive side of the puck, but their goaltending has been instrumental in their success. Andrew Shortridge leads all goalies with a 1.22 goals against average and only allowing 17 goals this season, least among goalies in the country. Shortridge is a brick wall in the crease. The Bulldogs need to find a way to break the wall down and get to Shortridge. Yale needs to play disciplined. Quinnipiac is second in the conference in power play percentage. Their power play struggled last year, but has been a vocal point in their game plan this season. The Bulldogs need to limit their time in the penalty box and keep the game at even strength. Also, Yale is third, behind Quinnipiac, in power play goals allowed this season. This game will come down to how well Yale plays at even strength. Puck drop is set for 7 PM Friday night. The Bobcats look to extend their win streak to five games, while the Bulldogs look to dethrone the number four team in the country.